• The first background roller system introduced to the photographic profession. • Designed with quality in mind, it's proven to be exceptional in durability and dependability. PLEASE NOTE: Due to the physical size of this system, we must provide a freight quote. This website only uses UPS to calculate shipping. Please call Toll-Free or send an email with Specific Address for your freight quotation. Roller Systems DO NOT include backdrops! They can be ordered from BACKGROUNDS category. 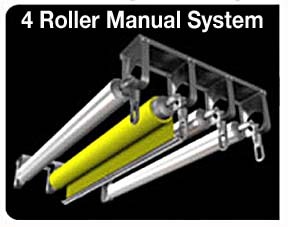 The Background Roller system is manufactured in the United States. • Rollers come standard in 9 or 12 foot widths but can be converted to 3ft or up to 20ft wide! 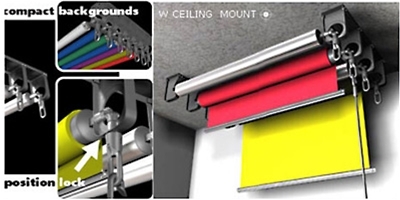 • Ceiling mount units can support up to four roller mounted backgrounds greater than 3 1/2'' dia. or seven roller mounted backgrounds less than 3 1/2'' dia. • Wall mount units can support up to three roller mounted backgrounds greater than 3 1/2'' dia. or five roller mounted backgrounds less than 3 1/2'' dia. • Manual units use a hand crank with a spring loaded clutch to insure backgrounds stay locked when you let go. We recommend every system purchase a set of Cutting Edge to keep your backdrops taught when rolling up and down! 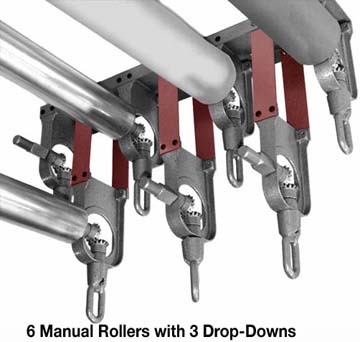 See the link below at Background Roller System Accessories. SEE LINKS BELOW FOR EXTRA SYSTEM ACCESSORIES! Actual FINAL Shipping Amounts will be e-mailed after you submit your order. Specific Address and a TRUCK SHIPMENT for the best price! PLEASE SELECT YOUR BACKDROPS FROM AMONG OUR BACKGROUNDS/STANDS SELECTIONS. 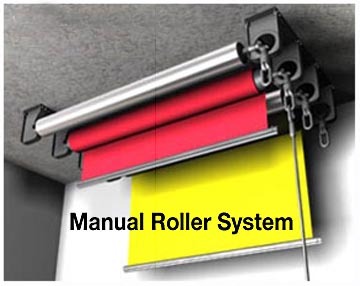 ROLLER SYSTEMS DO NOT INCLUDE BACKGROUNDS, THEY MUST BE ORDERED SEPARATELY!